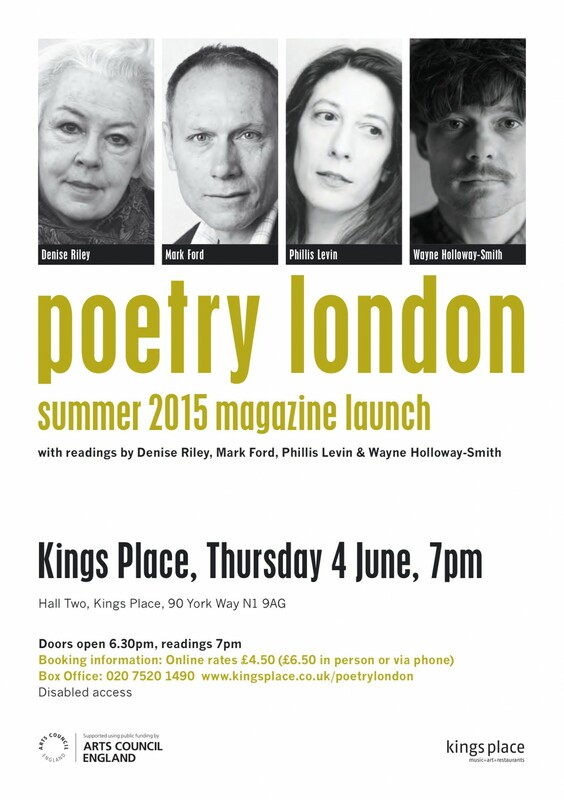 Poetry London will be launching its Summer 2015 issue at Kings Place on 4 June. The launch will offer a unique opportunity to hear some of the magazine’s most distinguished contributors. 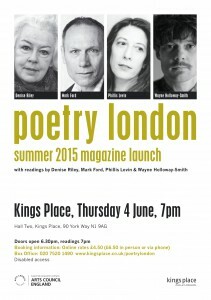 Please join us for an evening of great poetry. Phillis Levin is coming to Kings Place from New York. Her fifth collection will be published by Penguin USA next year. Mark Ford’s most recent collections are from Faber & Faber. His Selected Poems was published in the US last year. Denise Riley is widely known as a poet and philosopher who began to be published in the 70s. Her new collection, Unquiet, will be published by Picador in 2016. Wayne Holloway-Smith is a newcomer to Poetry London. His debut pamphlet was published by Donut Press in 2011.